It seem that there is a news item about the FARM:shop just about every day. The publicity and community involvement that this small urban agriculture project in London has generated is more than impressive. If you are not familiar with it have a look at this Flickr photo set. It is a good place to start. Projects like this should be in every city in America. Currently the topic of “urban agriculture” is dominated by a culture that seems only to worship digging in the dirt. There are other more modern and productive ways to produce food in the city that are not tied to expensive and often-contaminated land. The FARM:shop is exploring them. The project is obviously attracting the attention of London urbanites including horticulturists, urban activists, artists, designers and business people. We would do well to investigate the reasons for its success. Click on the link above and you can zoom around this high-res photo of the Gold award winning B&Q garden at the Chelsea Flower Show. The garden is such a great melding of horticultural tradition and modernity. Oh, how I wish that I could have attended this fantastic show. All of the plants produce edibles. The tower uses hydroponics. The structure to the left of the tower is the "insect hotel". Watch a video of school children constructing the individual "rooms" for the insects. If you sit at the glass dining table in front of the tower, you will see fish (tilapia) swimming below. Would you like fresh fish and salad for dinner? Photo - Jodi Hilton for The New York Times - Harvard Pilgrim in Massachusetts is one of many companies that have started gardens as an economical way to encourage a healthy work force. Continuing on the subject of company gardens, this was an article in the NY Times about the subject. If the author of the article and the companies involved were more aware of the benefits of sub-irrigated planter systems (SIPs) this would be an entirely different article. The article isn't necessarily negative about company gardens but it has a skeptical tone. There would be no skepticism if the gardens were all SIP gardens. If they were all SIP gardens, they could all be certified organic from day one, producing twice as much while using 80-90% less water. The gardens would also be much easier to maintain even by those who are physically limited. The excerpt about the Google garden is a good clue that the NY Times writer simply doesn't get it. Incidentally, it would be nice to credit the name of the company as EarthBox instead of "earth box". Company Vegetable Garden: Right Road, Wrong Direction! What a neat employee fringe benefit this is. It's a superb idea but the execution is faulty. This should be a sub-irrigated planter system (SIPs) garden instead of a dirt garden. It's foolish to grow in dirt that may be contaminated when the plants could be growing in a certified organic SIPs environment producing twice as much using 80-90% less water. It would also be much more user friendly for the employee gardeners. Anyone can learn to garden with SIPs. Part of it could even be an enabled garden. There would many more company vegetable gardens if business owners and CEOs knew about the many benefits of SIPs. They don't because our education system is broken. John and Jennifer in the EarthBox Parking Lot Garden with another bushel of tomatoes! This photo was taken in the EarthBox headquarters parking lot garden. The tomatoes were grown on blacktop. They could just as well be the production of any sub-irrigated planter system (SIPs) including sub-irrigated raised beds. This could be any school , community, or company garden anywhere in the U.S. See a photo set of the parking lot garden. Ask yourself why we do not have gardens like this all across the country. Okay, so they paved paradise to put up a parking lot as Joni Mitchell wrote back in the '70's. That doesn't mean that you can't have a vegetable garden on it. The folks at Chicago's Progressive Talk Radio proved that you can. 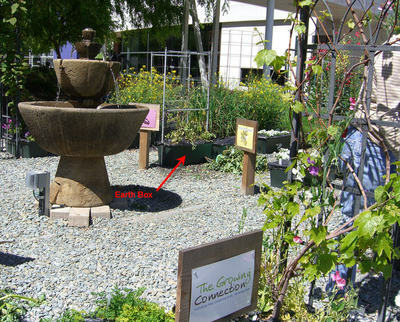 They did it with EarthBox sub-irrigated planters (SIPs). Good for them for still believing in the creative paradise of their minds.